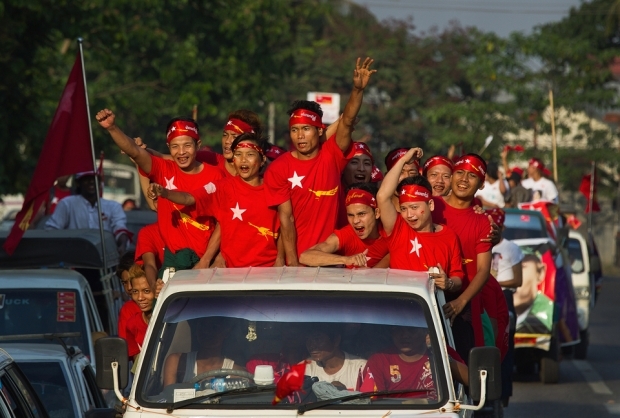 National League for Democracy supporters cheer as they parade in a road rally ahead of the parliamentary elections March 30, 2012 in Yangon, Myanmar. Chinese netizens’ reactions to tentative democratic reforms in neighboring Myanmar, including to the recent repeal of censorship rules for private publishers by the Southeast Asian nation’s reformist government, reflect just how closely it’s possible for average Chinese to follow—and criticize—international relations even when their own access to information about the outside world is limited by the state-controlled press. China’s information bottleneck has long driven the intellectually curious to seek out other viewpoints. When Myanmar’s opposition leader and Nobel Peace Prize laureate Aung San Suu Kyi began her visit to the United States on September 17, Chinese netizens were watching closely. They remained glued to the news a week later, when Myanmar President Thein Sein, a man whose name Washington only recently erased from a list of people barred from doing business with American companies, also showed up in the U.S. capital for a state visit. The dual U.S. visits by the leaders of both ends of Myanmar’s historical political spectrum were landmarks in the thawing of U.S.-Myanmar relations and suggested progress in the poor nation’s steady reconciliation with its own people. As Suu Kyi embarked on her three-week American tour, Thein Sein’s government, an outgrowth of the long-ruling military junta that kept Suu Kyi under house arrest for fifteen years, announced that it would release 514 political prisoners. Unremarkably, Myanmar’s efforts at rapid reform have captured the attention of the world. On October 18, the U.S. State Department’s human rights point man Michael Posner said he is optimistic that engaging with Myanmar’s reformist government can yield results. After returning to Washington from two days of unprecedented bilateral talks in Naypyitaw, Posner told the Associated Press that he found the reformist government officials there to be open, practical, and honest. Myanmar opposition leader Aung San Suu Kyi addresses journalists and supporters at her National League for Democracy headquarters in Yangon on April 2, 2012. Myanmar has just started its reform and faces considerable uncertainty. Its reform measures have not yet proved to be effective. It seems to have come a long way in a short time but that is only because of its recent break with prolonged military rule. The rationale behind its reform is utilitarian—to convince the West to lift sanctions. Myanmar’s reform is still at an experimental and formative stage and its most prominent characteristic is actually boldness ... But any utilitarian attempt should be pragmatic and realistic. The success of a reform does not depend on an idea, a slogan or a bold move but on its result and the practical benefits it brings to the people. China’s reform has undergone numerous tribulations and trials while Myanmar’s reform is still a flower bud that has not experienced any hardship. While we wish Myanmar success, we would be too naive and weak-minded if we wavered from our own path simply because China, a giant tree with deep roots and thick leaves, looks different from a flower bud. China has made and will make significant progress in promoting freedom of the press. There is no turning back. But we need to answer the call of the times and go forward based on the reality of conditions in China instead of idolizing backward countries like Myanmar and Vietnam in utter stupefaction. Some attacked the Global Times editorial with a historical metaphor. One weibo user called Dengba invoked the One Hundred Days Reform of the late Qing Dynasty (1644-1911), when China’s emperor rolled out a series of policies—modeled on Japan’s earlier Meiji Restoration—to modernize Chinese society, only to see the powerful conservative faction in his court shut them down a few months later. One day after the Global Times slammed Myanmar’s press reforms, China’s netizenry were astonished to learn of the suicide of Xu Huaiqian, editor-in-chief of the Earth, a People’s Daily supplement. According to the People’s Daily Online, Xu, who killed himself at home, had suffered from depression and had applied for medical leave. But writer Zhang Hongjie posted a message on weibo suggesting Xu’s condition had been more complicated than how it had been described by his employer. Zhang said that while Xu had enjoyed the benefits of working for China’s state media, Xu also had revealed in an interview that he was experiencing great mental distress. “My pain is that I don’t dare to say what I think or write down what I say. Even if I write it down, there’s nowhere for me to publish it,” Zhang quoted Xu as saying in their interview. Later, Zhang’s weibo post was deleted. That Zhang’s post went up online at all and, potentially, was read by hundreds of thousands, if not millions, of netizens, reflects just how much greater China’s outlets to free expression have become in the weibo age. But China, its half a billion netizens, and its average citizens not yet online—another half a billion people more—still remain aloof about many of their neighbors: countries that have gone further in loosening restrictions their citizens’ political and civil rights. In 2010, Myanmar held its first national elections in twenty years. It ended military rule and ushered in a civilian government in 2011. 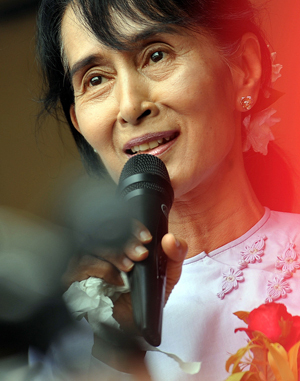 Earlier this year, Aung San Suu Kyi won a by-election for a seat in parliament. Thein Sein, during his visit to the U.S., told the BBC that he would accept Suu Kyi as Myanmar’s leader as long as the people chose her in the 2015 election. In nearby Vietnam, the National Assembly, which used to be considered a rubber-stamp legislature, has become more independent and outspoken in a series of moves. In June 2010 it rejected a Communist Party-backed plan to build a $56 billion high-speed rail project with Japanese backing, arguing that it would not serve the people, 70 percent of whom still live in rural areas. Meanwhile, established democracies elsewhere in Asia have stepped up their efforts to promote freedom of expression. In late August, for example, South Korea’s move to force its netizens to register their real names to post comments to the web was ruled unconstitutional on the grounds of protecting free speech behind anonymity. It is against the brightening backdrop held up by China’s neighbors that Beijing’s suspicion and wariness of basic freedoms and rights seems anachronistic. The Global Times editorial is oddly reminiscent of Emperor Qianlong’s reaction to the Macartney Mission in 1793. The British aimed to expand trade with the Qing Empire, but Lord Macartney’s entreaties famously ended in failure because Qianlong found engagement with the rest of the world unnecessary. China, believed the emperor, possessed everything it needed in abundance, and, as such, it was unnecessary to “import the manufactures of outside barbarians.” “Strange and costly objects do not interest me,” Qianlong wrote in the letter he sent back to King George III.